With dangerous, and in some cases life threatening wind chills in the forecast this week. Medical experts are urging you to take care of your skin. Wind Chills are forecast this week to be 20 to in some cases 40 below zero. And at those temperatures, exposed skin can begin suffering the effects of Frostbite in less than a minute. 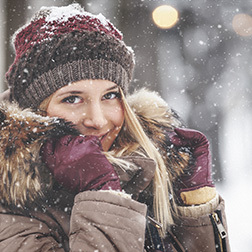 Your extremities are at the most risk, such as fingers, toes, ears and your cheeks. The first signs of Frostbite include a burning sensation of your skin followed by blistering and changes in skin color. So what do you do if you think you may have frostbite? “Go to a warm place, If you have any clothing that's wet, take that off, and then rewarm that body part and you want to do that by using warm water, you don't want to use hot water and you don't want to use dry heat because that's really hard to regulate the temperature, “said Megan Nordstrom, Nurse Practitioner CHI St. Alexius Heath Urgent Care. She adds to also wear some sort of eye protection because many people don't realize the corneas of your eyes can also be frostbitten.